All processes and and activities are well known and clearly understood by all those who need to know – in theory. As soon as two or more participants of a given activity are asked to describe it in a detailed and precise form, the resulting discrepancies are frequently astonishing. This gets even more pronounced as soon as the next process level is addressed with questions like “why is the activity done exactly that way?”, “what is the exact purpose?” and “who uses – or is supposed to use – the activities output”? In such a situation, visualisation helps a lot to develop a better and most important a common understanding of processes. Fishbone diagrams, (Ishikawa diagrams), are a very common and frequently used visualisation tool. However, we prefer Swim Lane Diagrams over Ishikawa since this format allows additionally illustration of interactions, time frames or resource demands. 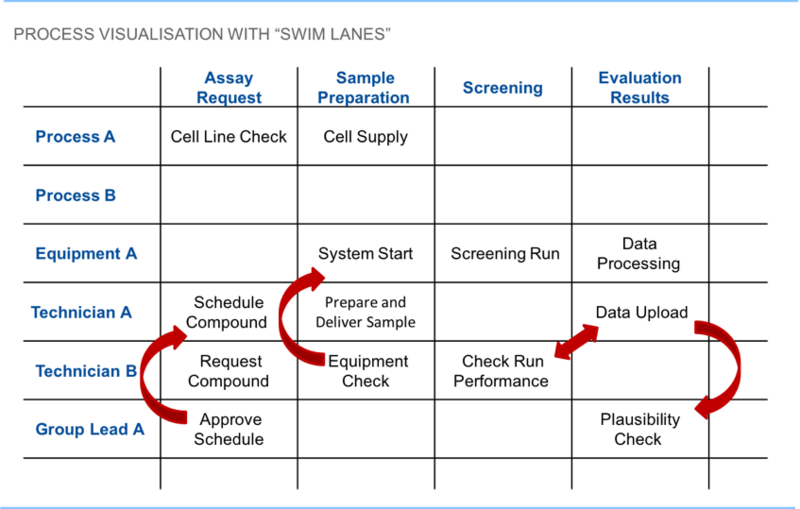 Simplicity, ease and speed of use and increased process understanding beyond the narrative makes them a helpful tool for the Definition Phase of quality initiatives in Drug Discovery.